and singers petitioned the queen mother of elephants to bless hunters, described the frustration of women unable to go out into the courtyard to dance in the light of the full moon; and lamented the struggles of the tea plantation workers' lives. 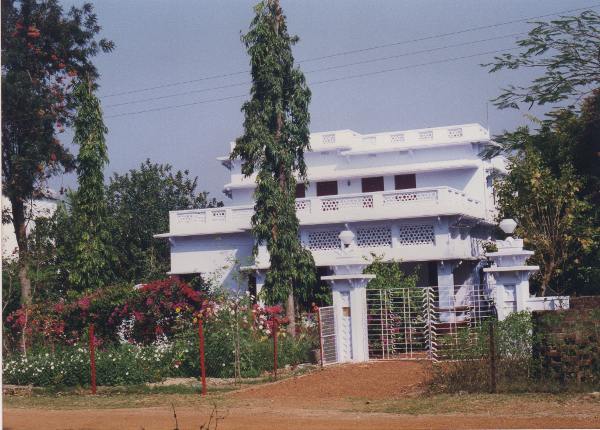 diffusion of knowledge about the cultures and traditions which enrich our nation and the world". 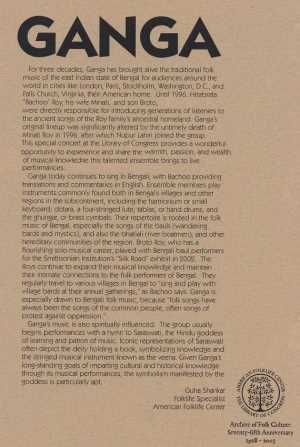 GANGA, led by Broto Roy, is a music group from the state of Bengal in East India, and derives its name from the river Ganges. The group first appeared in the American folk scene in 1984 and has since performed throughout the USA and at international folk festivals. 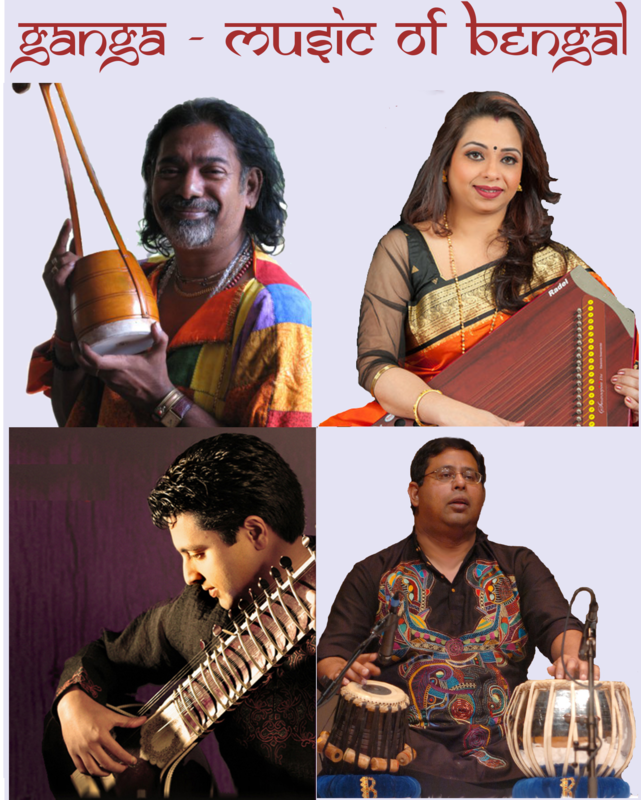 The quartet GANGA's songs of Bengal reflect the history of hundreds of regional folk and classical 'raga' traditions in India that are part of an extraordinary oral tradition preserved for several thousands of years. Songs of GANGA grew from the lush green countryside; from the foothills of the Himalayas where elephants and people have a symbiotic relationship; from the 19th century tea plantations which once reduced tribal people to slavery and from the minds of the people seeking a spiritual path to the divine. The rivers of Bengal seem to have been an especially fertile ground for songs sung by peasants and boatmen and the underprivileged lower castes. 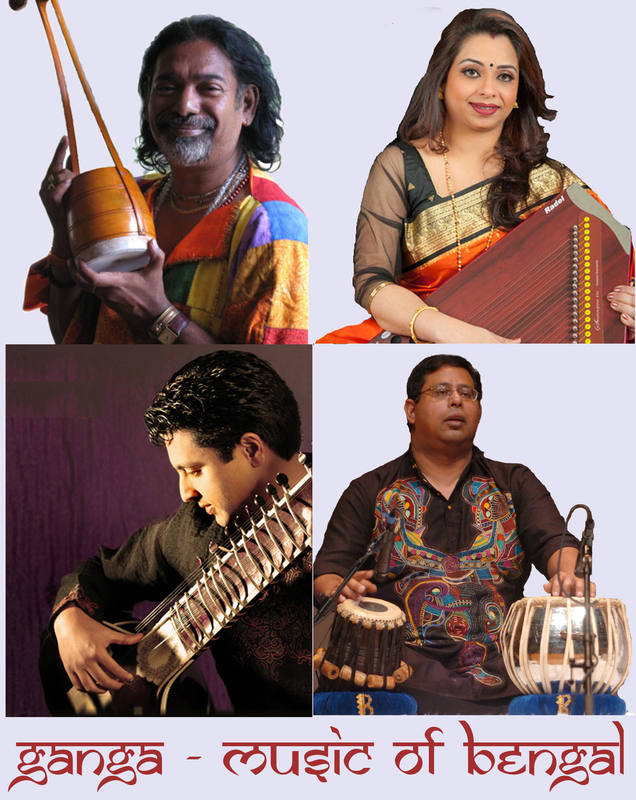 All have added to the richness of the Bengali musical tradition that GANGA wishes to share with you. The themes which resonate in GANGA's repertoire include human rights, eradication of world hunger, spirituality and cultural revival. 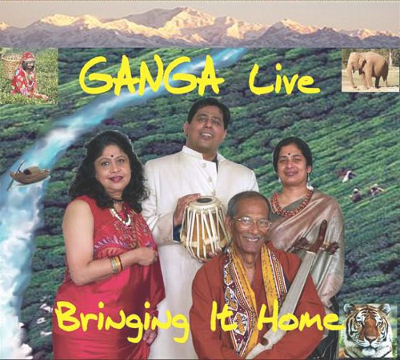 GANGA travels and collects songs from India's villages and folklore. 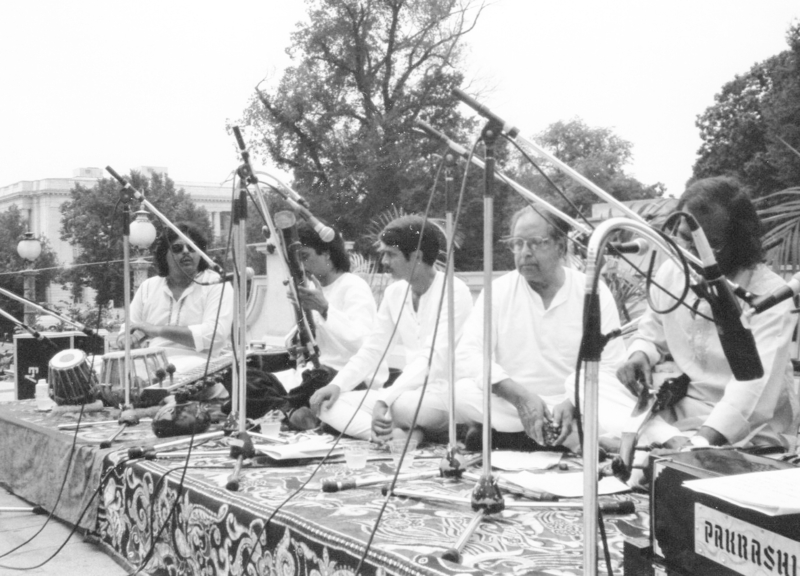 GANGA's songs demonstrate that millions long to dream and that equity and rights have been universal concerns for hundreds of years. Through their extraordinary expression, the vast underclass of India voice their wisdom and prove that while they may be illiterate, they have never been dumb. 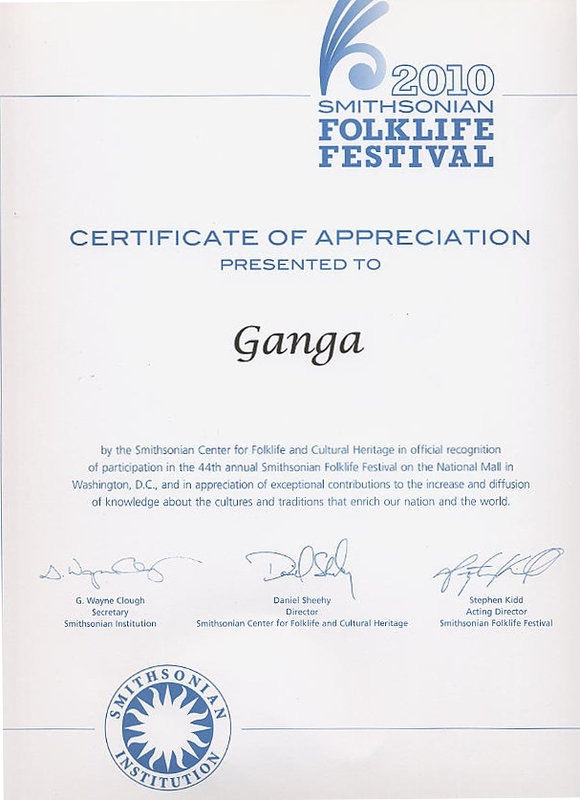 GANGA's acoustic instruments are crafted by villagers: "Dotara", a four-stringed member of the lute family; sitar, India's most popular stringed instrument; Harmonium, a South Asian adaptation of a small keyboard; "Tabla" - India's most popular hand drums, and brass cymbals and dance. 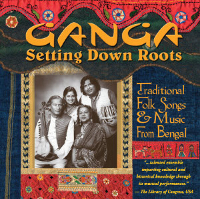 GANGA - 2011 CD Release "Bringing It Home"
"GANGA" 2008 CD Release "Setting Down Roots"
Workshops also available. Price applies within a 3-hour road travel radius from Washington, DC. Outside the radius, hotel and travel will be additional costs.